Almost everything in this book is innovative (…). The proof of its value will gradually emerge over the next decade or so." "I have no hesitation in recommending it as a first-class volume (…) It is also the fruit of a great deal of expertise, and I expect my copy to get a lot of use." 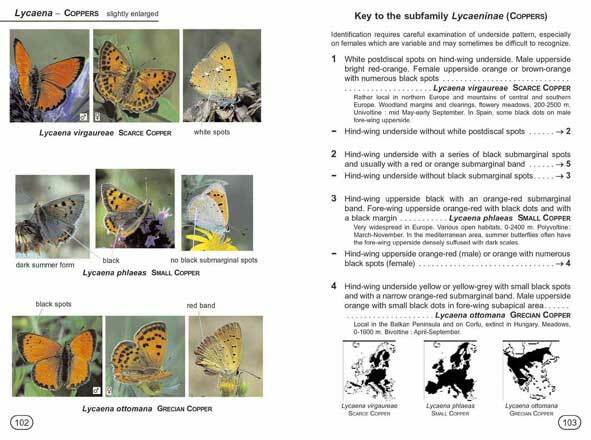 "It really is an addition to the existing guides to the butterflies of Europe and one that goes much further than the others." "A must for anyone interested in identifying butterflies." "To test it out a group of 12 enthusiasts used the guide on a trip to the Pyrenees. Their verdict was that it did surprisingly well. Indeed, it became our group's book of choice." "I have attempted to use several of the best known "field guides" available and found each to be quite inadequate. (…) Finally, however, help has arrived ! With the publication of Tristan Lafranchis's butterflies of Europe, I cannot wait to go back to Europe to butterfly (…). I highly recommend this book." "This is positively the best European ID book I have yet discovered."